Because the microcontroller integrates the watchdog, CCU comparison unit, analog comparator, A/D converter and other components, it simplifies the circuit design and saves costs.The MCU is powered by +3V and is supplied by the regulator chip HT7130. It uses a 2.4576MHz crystal oscillator with a machine cycle of approximately 0.8. The reset mode of the MCU selects the internal power-on reset mode. When the internal reset of transducer for distance is selected, the Pl.5 pin is only used as an input, and the pull-up resistor R9 is connected. When the software is programmed, the RPE bit of UCFG1.6 is set to 0. An internal power-on reset is available. The ultrasonic distance sensor of transmitting circuit is composed of an ultrasonic excitation circuit and an ultrasonic transducer (probe). Ultrasonic transducer is a device used to transmit and receive ultrasonic waves. 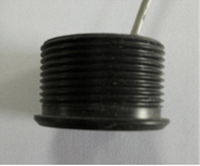 It is the most important component of the ultrasonic ranging transducers. Its performance index directly affects the characteristics of transmitting and receiving ultrasonic waves, and plays a decisive role in ultrasonic ranging capability. . The function of the excitation circuit is to excite the ultrasonic transducer, and a certain form of voltage excitation signal is applied to the transducer, and the piezoelectric wafer of the transducer converts the electrical energy into an ultrasonic signal. Therefore, the excitation signal also directly affects the characteristics of the ultrasonic signal. 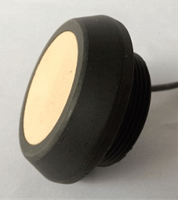 The function of the distance measuring transducer is to capture the ultrasonic echo signal. The receiving system consists of two parts: one is the signal conditioning part; the other is the signal acquisition part. The ultrasonic sensor transducer converts the ultrasonic echo signal into an electrical pulse signal, but the single chip cannot directly collect the signal because the ultrasonic wave has a certain loss during the propagation of the propagation and the obstacles reflected by different media, and the amplitude of the echo signal follows the obstacle. The distance of the object decreases and decreases. Therefore, before the signal enters the single chip, it is necessary to amplify the effective signal, filter out noise and interference, to achieve the maximum signal to noise ratio, thereby obtaining accurate information, and finally entering the single chip after comparison and shaping. The ultrasonic range finding sensor is 3cm~1m. Therefore, in the processing of the echo signal, the echo signals of different amplitudes reflected from different distances should be taken into consideration, and the echo signals should be amplified as much as possible. The chip is used to perform four-stage amplification on the echo signal, and then the signal output by the amplifier is subjected to shaping filtering. When is designing an ultrasonic receiving circuit, the piezoelectric transducer is equivalent to a charge or voltage equivalent circuit. 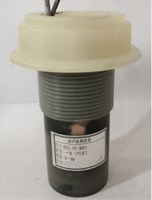 The voltage equivalent circuit is suitable for high-frequency measurement, considering the insulation resistance R of the piezoelectric transducer, and the cable capacitance C, the piezoelectric transducer voltage equivalent circuit. The echo signal will decrease with the increasing of the distance during the propagation of the ultrasonic wave. This article uses the chip to amplify the signal. It is a four-input, high-performance, low-noise operational amplifier with a very high conversion rate. , low input bias and bias current, low offset voltage temperature coefficient. It is echo receiving and filtering amplifier circuit. The characteristics of ultrasonic wave and the ultrasonic propagation of the medium,it is the type of ultrasonic distance range transducer and the working mode, the principle of using the transit time method and the advantages and disadvantages of using the single probe transceiving sensor and the dual probe sensor are described. According to the principle of ultrasonic ranging and the idea and principle of system design, the hardware circuit design of ultrasonic ranging system is introduced. The selection and circuit of single-chip microcomputer, ultrasonic transmitting circuit and ultrasonic receiving circuit are introduced.